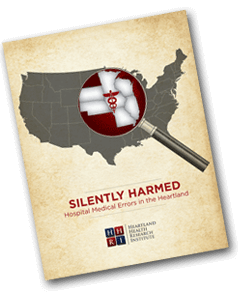 Heartland Health Research Institute (HHRI) has released its ‘Silently Harmed’ White Paper that provides estimates for patients who were fatally and seriously harmed in seven Heartland states due to preventable adverse events (PAEs) in hospitals. Report Highlights include national background data and newly-released estimates about PAEs in Hospitals for each of the Seven Heartland States: Illinois. Iowa. Minnesota. Missouri. Nebraska. South Dakota. Wisconsin. » Click here to download your Free ‘Silently Harmed in the Heartland’ White Paper.